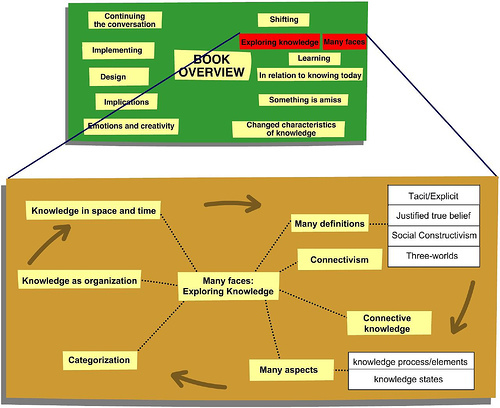 Knowledge representation is complex, confusing, difficult, emerging and evolving - So how do we deal with it? Ad hoc sketches, informal, qualitative and physical models, scenario construction, concept maps, rule sets, structured text, voice and video recordings all serve as representation, reflecting the expectations and experience of their creators, they connect collaboration to future use. They serve a dual role: (a) to facilitate design and critique and (b) to serve as the holder for the product to be, they are affordances in design, which they can enhance or inhibit. Representations, clarify, extend, complete and move unique experiences and abstract ideas toward the essential and typical. Representations are physical, tangible and material, they allow ideas and experience to have an independent existence in an externalized form, they help to capture emergent thought. Like a lump of clay, a representation is tangible and tactile, it can be pointed to, passed around, played with, reshaped and stored. It takes thought experimentation one step further, eliciting new ideas. On the formal side representations can be used for inference, in reasoning and as symbols, think rule sets, cases, predicate logic, spatial reasoning. Boundary objects (concept maps, ontologies, source documents) serve as a vehicle, container and carrier, for ideas and meaning (reification). When a representation crosses (community) boundaries, there is often a loss of meaning and context, which is counter-balanced by an opportunity for new negotiations, different views and altered meaning. This points to the importance of establishing rationale & context in use or practice, an essential non-represented aspect associated with any formalism. All representations are situated in use. An important aspect of a memory object is its trajectory, i.e. the consequences of later use. We use stories, cases, tags, metaphor, rules, heuristics, diagrams, patterns, templates, FAQs, lessons learned, learning histories...... what we then capture may be information rather than knowledge - if our key knowledge is tacit, embedded, emergent, present as a flow rather than a store, requires continual interaction and negotiation, is situated and distributed. No representation can stand on its own, we need an appreciation of the setting as situatedness, is ubiquitous, subtle and mostly represents a context that is just 'below our radar'. Annotation (in the widest sense) is emerging as the forgotten stepchild of e-Learning and knowledge creation. This goes way beyond appending PosIt notes, writing in the margin or sequential replies to the editor; to collaborative writing & editing, refractoring, annealing text, awareness, pull notification and joint work at the artifactual level. Annotation is as much about continual 'access to edit your words', i.e., changing from serial static publication to continual revisiting and revising the script, as it is about telling your cohorts to come and 'see', comment, change and interact. These two aspects,: (a) empowerment to change another's text, and (b) unintrusive notation must join the representation dance together. Hargadon & Sutton, HBR May/June 2000, 157-166, talk about keeping ideas alive by encapsulating them in prototypes, metaphor, collecting and playing with junk. Stories are recognized as important representation for conveying values and meaning. Collaborative concept mapping is a useful way to capture, refine and extend ideas and to explicate relationships. There are some interesting tools emerging as part of web2.0 that cover this. How then do you capture knowledge? The library 2.0 (L2) movement shares many interesting activities with KM as I understand it. Library 2.0 covers a wide field, from tagging OPAC, IM at the reference desk, to forming virtual communities and encouraging participation in content development, policy formation and asset selection & management. The L2 has been branded a 'movement' and passing 'fad' by some of the more traditionalists, but I believe the pioneers like Michael Casey, Ed Vielmetti and Michael Stephens are bringing a form of knowledge ecology to the library world and doing real world KM stuff. Libraries need to pay attention to ephemeral content, provide blogs and virtual community, annotation affordances, move into myspace, encourage community and conversation, move into gaming, IM and more.... oh such horror! What comes next? Recommender systems, Amazon feeds, iPod downloads.....???? If L2 is all about participation, collaboration, community, creative content, changing the context and bringing more people into the conversation - that is core KM stuff. I see the SLA has recently started a new KM division (about time!) and hope they will be embracing much of this L2 excitement. Do you any L2 thoughts to share?